2. Another bush I'm not going to beat around: Yes, Bagelsaurus is, hands-down, the best locally made bagels. Considering texture and flavor, toasted and un-toasted, they supply the gold standard. There's a reason the line is typically super long. It's most definitely worth it. I’ll admit that bagels haven’t been on the top of my breakfast list for the past few years, appearing mostly as pre-race fuel in my diet. I’d almost forgotten about Bagelsaurus since they moved from my ‘hood in Brookline (as a pop-up at Cutty’s) to Mass Ave. in Cambridge. Apparently, I’m the only one. Judging from the line down the block at 8:30 a.m. on a Saturday morning, the desire for these one-of-a-kind bagels is alive and well, and now I remember why. The unique sourdough starter used to make these bagels comes through in both flavor and texture, making them delicious whether you eat them fresh from the oven, a few hours later, or toasted and topped. Their creations are certainly worth waiting in line for, but if you really want to skip the wait on the weekends, there’s a separate line where you can get a dozen bagels (+ cream cheese & coffee) in about a minute and a half. Good deal! One to try: Plain — so you can really taste the sourdough, with honey rosemary cream cheese, the best cream cheese in this entire exploration. 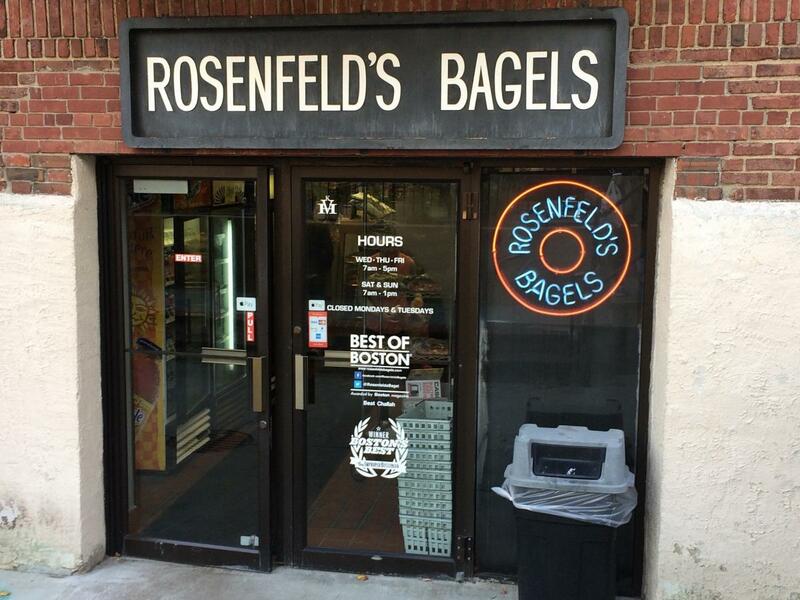 This Brookline staple was easily the most talked-about local bagel shop before Bagelsaurus came along. 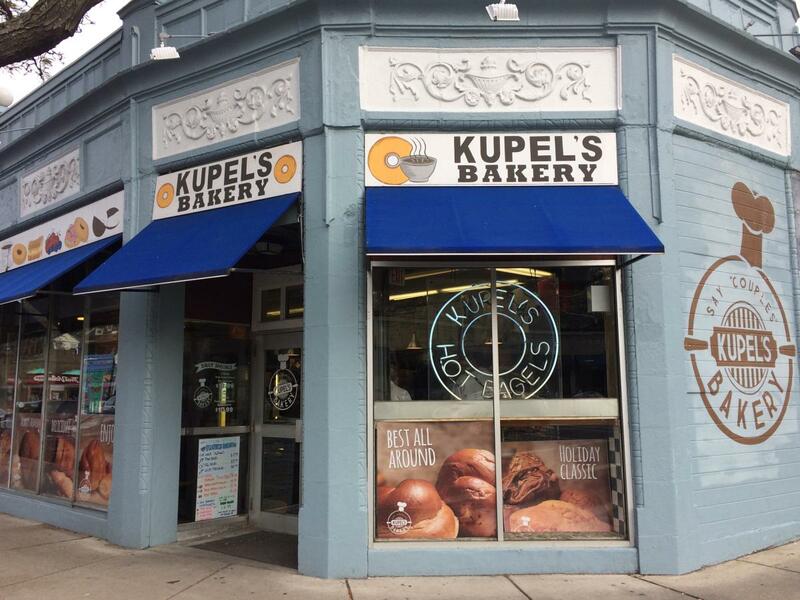 With the exception of not being open on Saturday’s (arguably the most popular bagel day of the week) this was THE place to get the best locally-made bagels, and it’s still a great choice. Their texture is smooth and crisp on the outside, with a light, chewy interior. With a solid wall full of classic flavors, it’s a reliable go-to for well-made bagels. You may think of Finagle as a big chain because of their availability in grocery stores, but it’s actually a small local company with just a few retail storefronts, and a great bagel history. The bagels have a slight sweetness to the dough and a good contrast between exterior and interior textures. These bagels are enjoyable without toasting, but only when they’re super fresh. If you’re going to eat them once they’ve cooled, toasting is definitely the way to go. Bonus: the Finagle retail shops have a unique and fun conveyer-belt feature that delivers your bagel to the prep station. Woosh! One to try: Pumpkin Raisin, because it’s seasonal. This one is a little hidden gem that you definitely have to go looking for. Its subterranean entrance and close quarters are no indication of the immense bagel selection inside. Mark Rosenfeld starting making his bagels here over 40 years ago, and the time-honored technique is still doing them well. And at just $1 each, you can’t beat the price! These bagels are best eaten well-toasted, and slathered with your favorite cream cheese spread — mocha chip is a unique option if you’re into sweet bagels. One to try: Sunflower. With a slight crunch of garlicky sweetness on the outside, it’s totally unexpected, and totally delicious. This small local chain of coffeehouses actually grew out of a bagel shop in Allston dating back to the ‘90’s. 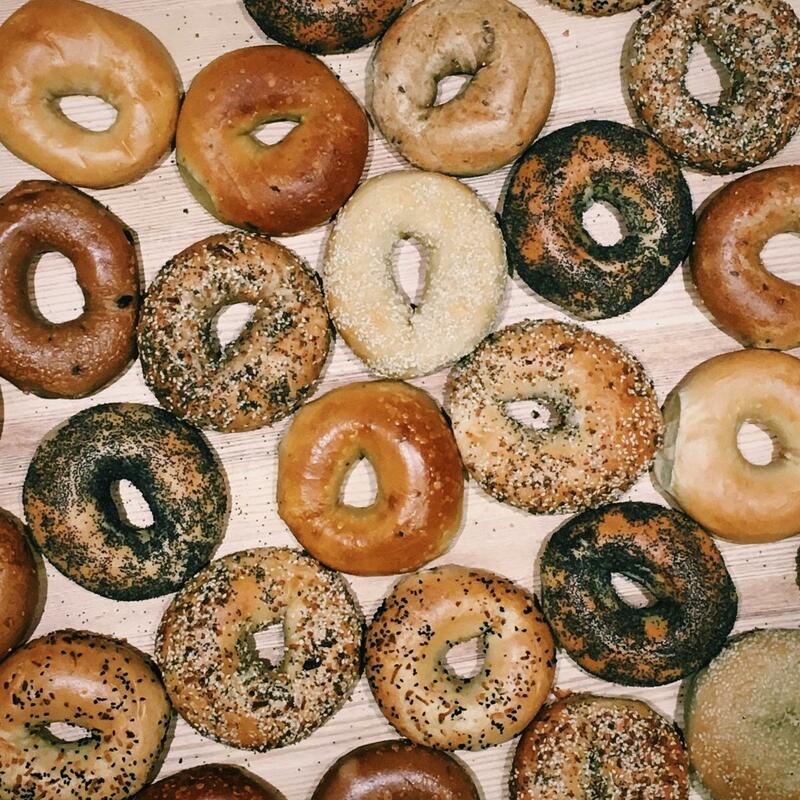 From Bagel Rising to Espresso Royale to Pavement — just about everything has changed over the years except the staple menu item: bagels. The texture isn’t quite on par with some of the other local options, but they have some fun flavors and make great breakfast sandwiches. One to try: Jalapeno. It’s not too spicy, but will add a kick to plain cream cheese or a breakfast sandwich. For all you South Shore people who want freshly made bagels, Gunther Tooties is the place to go. 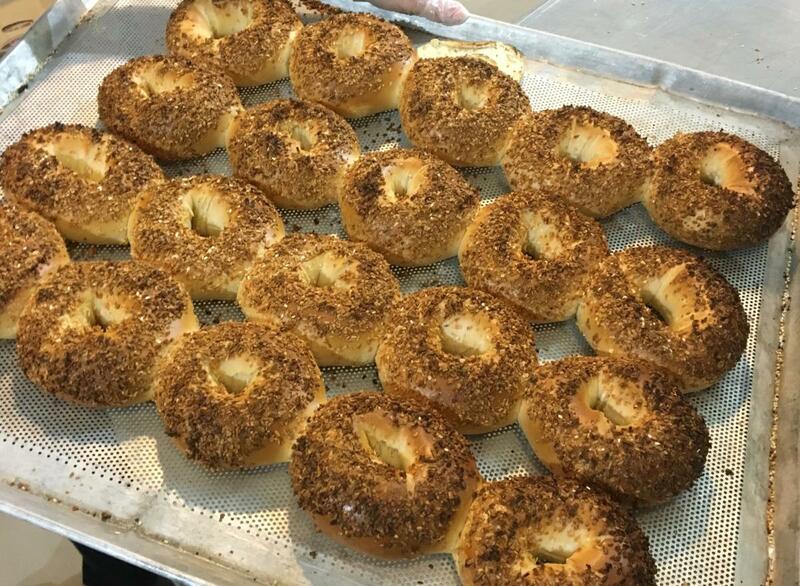 The name may make you laugh, but the bagel selection will make you drool. These were, by far, the softest bagels I cut into, but when toasted they had the classically crisp exterior with a soft, pillowy interior. Their “award-winning” French Toast bagel really does taste like its namesake, complete with maple syrup. One to try: (Besides French Toast) the sesame sourdough with bacon scallion cream cheese. It’s so bacon-y, this combo is basically a complete meal.